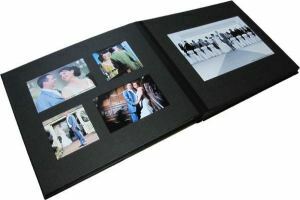 Butterwick Wells offer a range of stick on overlay mats that allow flexibility in album design, giving a traditional but contemporary look to our Bookbound Wedding Albums. Our overlay mats are available in black or white, with a discreet hessian embossed finish. They are supplied pre-taped with 6/12mm overlap double sided tape, so all you have to do is attach the photo to the overlay mat and stick onto the page. Aperture sizes are approximately 6mm (a quarter of an inch) smaller to allow for positioning and fixing the photograph, e.g. a 12" x 8" mat will have a 11.5" x 7.5" actual aperture. Photoshop compatible templates are available to download free to assist with album design and printing. 12" x 10" Download Templates being updated - contact us for information! 8" x 6" Download Templates being updated - contact us for information! Overlay Mats are included, where applicable, with our cd/ dvd folios and image folios - Outlines /Templates being updated - contact us for information!